Description: After the CSX crossing in central Dalton, the NS and CSX routes to Atlanta diverge, but not before the grade separation shown. Description: THIS LOCAL IS IN THE SIDING TO LET A THUR FREIGHT BY. Description: NS 6185 is leading a wesbound train with the Mitchellace building in the background. Description: UP Mt. Vernon Sub. - Milepost 339.1 - Southbound - Waits for 3 Northbounds on the Chester Sub. Description: This NS Yard Switcher was moving back in forth with a very important load on the first car. Description: A line of locomotives sits on the siding at CP BURN waiiting for 21M to pass. Description: Last time I was here, it was a CR SD38/mate combo! Description: At the top of the hump. 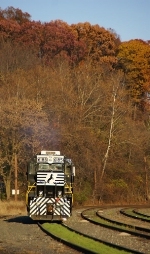 Description: Zoomed in on NS 6185 and 862 in the Allentown Yard. Description: Not sure whether this was a damaged car or a customer request, but this forklift was unloading paper rolls from these two boxcars parked near the car shop. Some engines and a slug set can be seen on the right. Description: NS 6185 and 862 pushing cars towards the hump. Description: NS 862 and 6185 at the NS Allentown Yard.